British Sign Language (BSL) has been in use for hundreds of years. English Physician and Philosopher John Bulwar dedicated his book Philocophus (1648) to two deaf brothers. 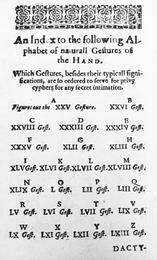 His earlier book, Chirologia (1644) describes signs and gestures in use at the time – some resemble signs still in use. References to Sign Language are found in Greek and Roman writings as well as the Bible. BSL was officially recognised by the British Government in 2003 as an official minority language. Modern-day BSL is used by over 120,000 deaf adults and about 20,000 deaf children. Sign Language interpreters are trained to use BSL, and a Deaf person may have friends and family members learn at least some of the language to communicate with them effectively. Signs vary across the UK and BSL has it’s own grammar and sentence structures that are different from English, making it a unique language; just like a spoken language, there are accents and regional variations and colloquialisms in BSL. The fingerspelling alphabet is used in sign language to spell out names of people and places for which there is not a sign. BSL is a living, developing language! For many people, learning a language can be one of the most daunting but exciting hobbies. Our reasons for learning a language are varied, and many people worry that learning British Sign Language must be difficult. (spoiler: it isn’t!). So here are five fantastic reasons why you should consider learning British Sign Language. Let us know at the end of the article if you have tried to learn! If you want to learn, get in touch! Communication is the key to communities working together. Deaf people can feel excluded from so many community activities simply because of communication barriers. Be part of the change for more inclusivity by learning sign language and be a doorway to access for Deaf and hard of hearing people around you. Don’t miss out on getting to know a vibrant section of society because of language; learning even simple greetings can help you to break down the barriers between each other and help to integrate your Deaf and hard of hearing neighbours into the wider community. Freelance interpreters can earn around £25-35 an hour and are usually required to have interpreter and BSL qualifications recognised by Signature (formerly CACDP). Check out their website for a guide to the qualifications that you can work towards. Bear in mind that most BSL interpreters study for around seven years to become fully qualified, but don’t let that put you off! You can work in various contexts as you train and remember that there is an element of life-long learning – you will never be finished! Your clients can be extremely varied and you will put your skills for team-working, communication, confidence with people and care for others to good use. Deaf Unity is now offering Sign Language lessons. Go to our Learn BSL resources page for more information and feel free to get in touch to ask us any questions about the courses. If you’d like to read a first-hand experience of someone learning BSL, check out our interview with Laura-Jayne Green from the Hands 4 Voices Choir. With a BSL qualification, you will stand out! You will be able to find work in hearing impairment units in schools, as a campaigner, support worker, audiologist, teacher and many other local government services. You could use your communication skills to volunteer at events in the Deaf Community and provide a valuable service to charities around you. By learning BSL, you will open yourself up to so many exciting opportunities that will take you beyond your comfort zone. If you are in a management or recruitment role, read our article, Improving Support for Deaf Employees which explains how useful deaf awareness training is, as well as the importance of supporting D/deaf employees. Many hearing people who work in the sign language field were able to learn BSL as a child. Often, they had a friend whose parents were deaf, or a sibling who used BSL. Whatever the reason for the exposure, learning a different language at a young age can change the entire course of someone’s life and as we know it’s so much easier to absorb another language when we are young. Many schools offer Makaton and BSL lessons in the Early Years classes and after-school BSL clubs are a great way to encourage your child to learn the basics of sign language. Decorate your home with artwork that promotes sign language. Artist Nikki at Love Harry designed her own vibrant BSL alphabet prints when her son was learning to use BSL; she says, ‘As a sign language-loving family we wanted something beautiful to inspire us every day’. In early 2019, a petition was made to the Department of Education in the UK to offer BSL as a GCSE subject. Helping you children to learn sign language will certainly give them a head start if this petition is successful! Bonus reason: it’s great exercise! Using sign language is a fantastic form of exercise! An expressive signer will use his or her body, face and hands to bring a conversation alive – it’s a whole-body workout!